There are resources throughout each paragraph of the book to educate and help marketers reach their goals, as well as, make your life a lot easier. In chapter seven ‘Secrets for Selecting the Best Marketing Methods’ there are links to demographic studies, e-media and info-media. If you have the Kindle version, you can simply click and go to that link immediately. Plus there is a number of Case Scenerios showing the cost and time frame for running ads in the Yellow Pages, Television ad and Radio. 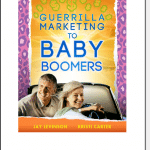 This book provides 150 ways to reach your audience through mini and maxi marketing methods. Chapter 19 disusses using Skymall as a resource to promote your business. Chapter 24 shows you ways to promote your business using Craigslist, eBay and several other online storefronts. The later chapters show how to put all of these methods into action. This book is a ‘Hands on Marketing Tool’ that is up-to-date with the current methods of marketing online and offline. 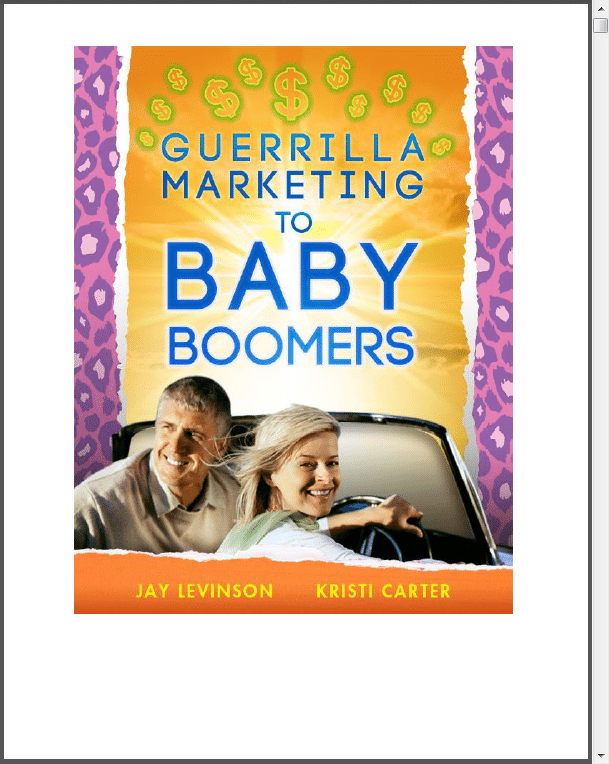 Using a few different marketing methods, both online and offline, will your heighten your exposure to the baby boomer customer. The older marketing methods such as telemarketing, billboard advertising and tradeshows are still a viable way to reach your potential customer. Wind advertising or cinema ad displays are a more modern way to leave an impression of your business in the minds of your targeted consumers-the baby boomers. Did you know that the biggest sector of people who attend movies are baby boomers? In chapter 22 you will learn all about Cinema advertising. Whether you are working home onlineor a large company, this book will get you the results you are after. You will be more effective in your marketing endeavors and be able to spend more time with the family as well as pursuing other interests besides ‘work’. The intention is for this book to be used in College Courses, big and small business and for the working home online entrepreneur. I wish you all much success, happiness and lots of family time.